Keto Hummus - Headbanger's Kitchen - Keto All The Way! As a glorified home cook (not a chef) I can safely say that potato is one of the most versatile foods on the planet. You can mash it, fry it, sautee it, boil it, bake it etc, you get the idea. What has potato got to do with Keto? It’s off the menu. Well I’m here to say Cauliflower is the new Potato. It’s not a food I ate much off in my life, in fact I think I quite disliked it. Fast forward to 2015 when I started my Keto journey and cauliflower became my saviour. I think there is nothing more versatile than cauliflower. I’ve made a cauliflower pizza, used it to replace mashed potatoes in Shepherd’s pie and even turned it into cauliflower upma. Safe to say, it’s the new potato. But what’s that got to do with hummus? 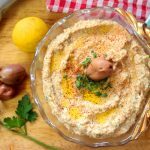 Well cauliflower is the perfect replacement for chick peas to make an incredible keto hummus, or cauliflower hummus. Anyway enough jibber jabber. Enjoy the video. While I made this in the food processor in the video, I did make a test batch in my Nutri-bullet the day before. The way the Nutri-bullet pureed the cauliflower was a much better texture overall, not that the food processor was bad, but it just didn’t have the same force. I also must mention that in my test batch I didn’t use an olives while pureeing the mixture, I actually chopped them and added later. I think that might also might be a better idea, I think you get that textural element in the hummus itself. You can go either way with this I think. 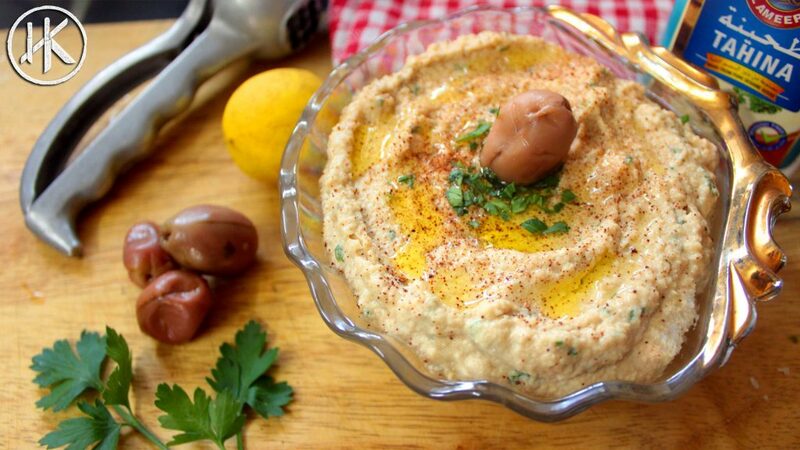 I would say this hummus would be best eaten with my Keto naan or even my Keto crackers. This recipe makes 12 servings. Get this recipe on myfitnesspal. You can up the fat quotient in this recipe by adding more olive oil to make it even more 'high fat'. You can also use water to make it smoother if you like. Just add everything in small incriments to ensure that you get the desired consistency. I made this just as recipe reads. I guess I am not a fan of kalamata olives so after tasting the original recipe, I blended in some roasted red bell pepper and will be feasting on the hummus and naan bread for lunch! I will try this again, minus the olives, as it gives me a great base to season as I please. Thanks! Thank you so much for posting this alternative, I do not like olives AT ALL so I’ll definitely be trying roasted red peppers! Wow. Great stuff. So simple. Came out amazing. Totally just made this with some added toasted sesame seed oil, chili oil, and some red pepper flakes. Mmm! This stuff is great with some home made almond sesame seed crackers. Love it! Just made this for myself, husband, and roomie, who all eat low-carb. This blew my mind. Hummus was something I sorely missed but now I feel like I’m going to be making this every week. I made major adjustments to the amount of spices and garlic but otherwise this was a great recipe!! OMG, this came out more amazing than i thought. I love the jibber jabber, dont stop. a new interest in sticking with my keto diet. Your recipes make me salivate. You need to weigh the final product and divide by 12 and that’s how you get 1 serving. youre so likeable.. dont stop the gibber jabber baby boy.. we love you. Made my first keto cauliflower based pizza , thx to Sahil secret recipe.oh mine..definitely out of the world..tastiest and healthiest pizza in the world with all the jibber jabber of course. Made this EXACTLY as written. Great recipe! thanks!! The link for the tahini is showing products not related to tahini. Could you please let me know the best Thaini to buy in India?